If you’re an avid deer hunter, your freezer is likely to be full to the brim each time you return from a hunting trip. That’s why you need some Canned Deer Meat Recipes to make sure all that good venison doesn’t go to waste. By canning deer meat, you ensure its readily available for making a variety of quick and easy dishes later. Plus, having rows of jars full of canned meat in your pantry can be reassuring if you’re a busy person. What’s even better is that you can have canned meat straight out of your jar, since its already cooked. Just put some sauce of your preference on it and you’re good to go. What You’ll Need to Can Deer Meat? What Can You Make With Canned Deer Meat? Saves space: By canning deer meat, you ensure there is no wastage of any meat that doesn’t fit in your freezer. Also, once it’s canned, you don’t have to keep it in the refrigerator. This frees up space in there for other perishable foods. Tastes great: Canned deer meat is tender and moist and tastes wonderful. It also has a lot of flavors. This means anything you make using Canned Deer Meat Recipes is going to be delicious to eat. Saves time: If you’re pressed for time, you can make quick and easy meals using canned meat. You can easily whip up soups or stews or sandwiches in no time. Because the meat is precooked, you’ll find that your cooking time is considerably reduced. Long shelf life: Canned deer meat has a shelf life of more than a year. As it does not have to be stored in a refrigerator, you can put them away in your pantry. You can store them for up to two years. However, it is recommended that you consume this within the first year. Jars for canning; make sure these come with proper lids and rings. A pressure cooker or canner. All your ingredients: canning salt, white vinegar, possibly some bouillon cubes. And, of course, raw deer meat. This is a quick and easy canned deer meat recipe you can try at home. The recipe spells out the ingredients you’ll need to make a quart jar full of canned deer meat. Turn the flame to full heat at the beginning. When the pressure cooker starts to let out some steam, you can lower the heat to medium. This will ensure you maintain enough heat in the pressure cooker to allow it to continue boiling. Once the 75 minutes is up, turn off the heat and let it cool for a while. Make sure all the steam from the pressure cooker is released so you can easily remove the lid from it. Next, carefully lift the jars out of your pressure cooker and place them on over a thick cloth or towel. Let the jars cool for a few more hours. You can even keep it overnight if you have the time. Once they start cooling, the lids will seal themselves and you’ll hear a popping sound as they do so. You can check if the seal is tight and firm after the jars have completely cooled. You can do this by pressing down gently on the middle of the lid to check if it stays firm. If it doesn’t, you can keep the jar in your refrigerator, so you can eat it first. If it does, you can store this away in your pantry. However, make sure your jar of canned deer meat is stored away from direct sunlight. If you’re canning meat over several days, then make sure you mark the jars with the date when it was canned. This will help you later when you’re trying to start with the oldest ones first. Well, a lot of quick and easy dishes, that’s for sure. Canned deer meat has great flavor and is tender, which means you can zap together some quick and delicious meals. 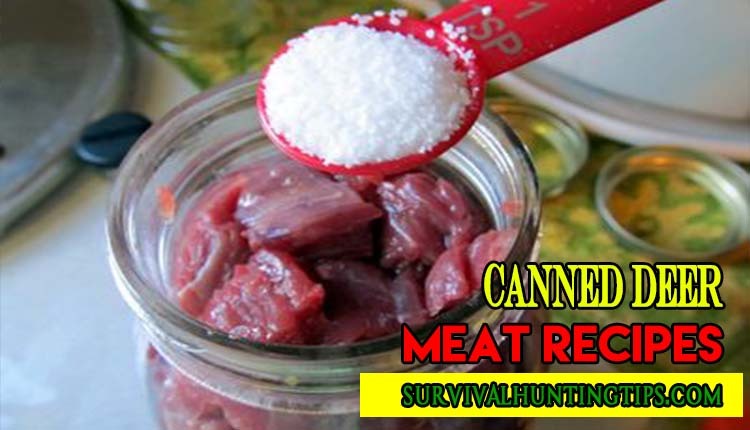 You can do this by following some simple Canned Deer Meat Recipes or coming up with your own. It tastes great in sandwiches, noodles, stew, and soup, or simply straight out the jar. Make your stew using all the vegetables and other ingredients you normally use. Once the vegetables are tender, your regular vegetable stew is ready. To this, simply add a quart jar of canned deer meat to the mix. You only need to heat the stew now as the meat is already tender. Once the stew is heated, your regular vegetable stew is ready to be served as venison stew instead. Slice some mushrooms and two onions. Chop some garlic and fresh celery. Take about two tablespoons of butter in a pan and sauté the onions until they turn slightly brown. Next, throw in your mushrooms and continue to sauté. Then add the celery and garlic to the mix. After that, add one quart of canned deer meat, along with its juices. Throw in some salt and pepper for seasoning. Then add some cream cheese and sour cream. You may even add a little bit of cornstarch with water to thicken it. Bring it to an After it’s ready, you can have it over rice or noodles. You can even have it with mashed or baked potatoes and vegetables. You can make easy sandwiches with canned deer Many people choose to experiment with their recipes when making sandwiches. A simple way to do this is to put the meat on your favorite bread type, add some mashed potatoes and your favorite sauce. You can also have it with cheese and peppers on your preferred choice of bun or bread. The truth is, there are plenty of Canned Deer Meat Recipes you can experiment with to make something different and fun at home. The great thing, however, is that canned deer meat saves you so much cooking time as it’s already cooked. Which is also why one of my favorite things to do is to simply have it straight out of the jar.